When I started this journey, I had an idea for a project that would help young adult to rediscover the art of conversation. And in Italy the family includes uncles, aunties, grannies, granddads, neighbours and anyone that happen to be passing by when the dinner was served. At the time it didn’t really seem to be that important, but as I spent 50 on this earth, I realised that the ... See More conversations, nuggets of information, jokes, laughter and that very important inter -generational crossover made a positive impact to my life. Listening to my favourite uncle talking about the good old days or my granny reminiscing about the War or even having a very animated conversation with my sisters about my favourite band, was all part of what made me. Looking at my teenage children, looking at the importance screen time – be it phone, tablet, tv or playstation – and the lack of conversational skills – or indeed the lack of interest in conversation, saddened me and genuinely worried me. The peer to peer conversation over Instagram, snapchat or whatever the next big thing is going to be, seemed to fall short of what I believe to be necessary and healthy for them. Over a glass of wine and lovely conversation with a couple of friends from Brazil, I mentioned that that I was worried about the very fabric of our society and the tears that started to appear. Social Fabric, the name, was born. When a friend of mine, Graham Bushe, completely the incredible feat of running the Wicklow Way race, 127 km, only to turn around and run back, I thought it would be a good idea to sit down with him and ask him how and why. I contacted the Outsider Magazine and asked them if they’d be interested in an article about Graham. They kindly agreed to the idea and off I went to meet with Graham. I thought I’d record the chat in case I missed anything for when I was going to write the story. What developed was the idea of the podcast. I thought that perhaps someone out there would like to know about an ordinary people doing extraordinary things. In the meatime, I decided to do a radio course in Near FM, in Coolock, Dublin. The course was brilliant and gave me a great taste for the radio, the studio, the recording systems and once I completed the course I put together a proposal for a weekly show. 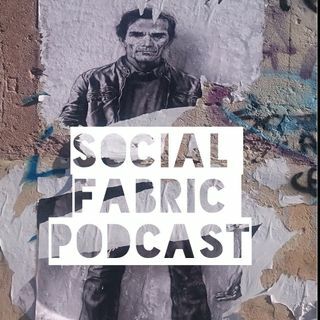 Social Fabric, the podcast was born. Loosely based on the fabulous Desert Island discs, in that the guests get to pick 7 songs that are meaningful to them, I decided to focus on Passion and community involvement. 9 months and 37 episodes later I have had the privilege to meet with a fantastic group of people whose lives, work, passion and drive could not have been more diverse. I learned so much from each one of them. From Eamon O’Connor of LuckyBones, what it means to be a passionate musician and how to make a living out of it. A special thanks to Eamon for allowing me to use his songs for the intro of the podcast, Alice will be played in full at the end of this. From Pol O’Conghaile –how to combine the love for writing and travelling to become a multi award winning travel writer. From Veronica Larsson – how yoga and really getting in touch with your body and soul can help your mental and physical health. From Mark Lawlor – the importance of being in touch with Nature and moving away from technologically distractions. From Barry Cronin – how true friends can see you through the darkest times. From Tony Duffin – how to help people that most of us would walk away from. A big thanks to you all for the bottom of my heart. You are all making a different in our society and hopefully someone out there will find some of these useful or at least entertaining. I’ll leave you with Alice by Lucky Bones and talk to you again in 2019.